What an enticing cover. Does it not draw you in, make you want to open those big blue doors, wander those mesmerising rooms and plunge into some serious creating? 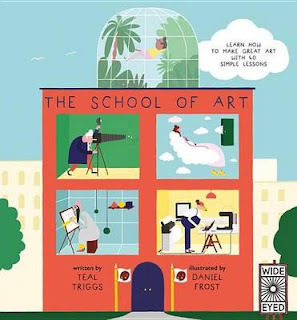 Children will love exploring this inclusive, welcoming art school, via the pages of a book. Put together by five illustrated professors, each provides invaluable lessons in the construct of many art forms. First, there's Professor of Ideas who discusses concepts in art and design. Then Professor of Form talks about formation and shape. Professor of Senses opens our eyes (and ears and sense of smell) to the wonder of art and design, while Professor of Making introduces us to the many and varied forms that can be used to make art. Lastly, Professor of the Planet discusses something that's not often covered when educating children about art--its effect on our world, on our planet and on the human race. Essentially, how art and design can make our lives better. Philippe Starck would be proud. This is a heart-thumping book. I wanted to dedicate an entire day to each and every page; it's that enthralling. I love that it explores art and design from the simplest of concepts--from simple line work through 3D shapes, the shadow, light and tone that give perspective, texture, pattern, direction, contrast, colour wheels--even the way certain colours make us feel. Children can also explore more sophisticated concepts such as grids, composition, silhouettes, asymmetry, balance, aesthetics, telling stories with art, using recycled materials, communicating, experimentation. Nothing, it seems, is left unexplored, and any child who meanders through the beautifully-illustrated pages of this book, will have their brains expanded exponentially as they take in new concepts and thoughts that are sure to inspire them to create. A stunning, thoughtful, intelligent, lust-worthy book. Well worth seeking out.